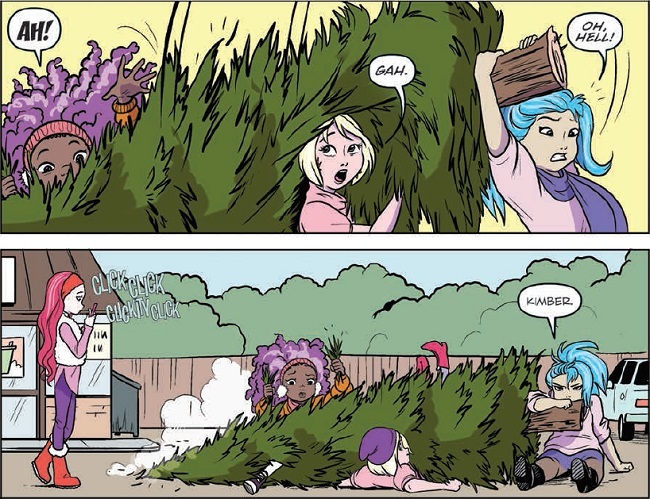 The Jem and the Holograms Holiday Special is incredibly sweet and good-hearted, crafting a festive story of goodwill amongst rivals. Its cheerfulness feels welcome after a few weeks of intense antagonism but doesn’t detract from the overall story of pitting “good girl” Holograms against “bad girl” Misfits; I make these generalisations, because, as this issue reveals, such distinctions are surface level only. What this book is actually about is two groups of friends with a lot of ambition, striving to be the best, and despite competition, supporting and caring for one another along the way. The team this issue consists of regular writer, Kelly Thompson, and new artist, Amy Mebberson, with colours from M. Victoria Robado and letters by Shawn Lee. Immediately, the issue marks itself as different with Mebberson’s slightly cartoony, but nonetheless charming, take on our Holograms in a typical, comedic scene; and yet, Mebberson’s art melds so well with Thompson’s writing in the scene, it feels comfortingly familiar. Instantly, we are swept up in the lives of the Holograms, with their sisterly love and frustrations, as they collect their Christmas tree and plan their holiday festivities. There are two things that really stick out about this issue, and the first is touched upon nice and early, and that is the romantic element of this comic. Jerrica has Rio, Aja has Craig, Kimber has Stormer and Shana has…no one. This is actually quite significant, not because it’s the holidays and everyone needs a partner to kiss under the mistletoe, but because it reflects the lack of attention that the character of Shana is afforded. Even in the original series, Shana often seemed to be dealt with as an afterthought. Neither her interest in fashion, nor her romantic interests, were ever really shown in much detail. 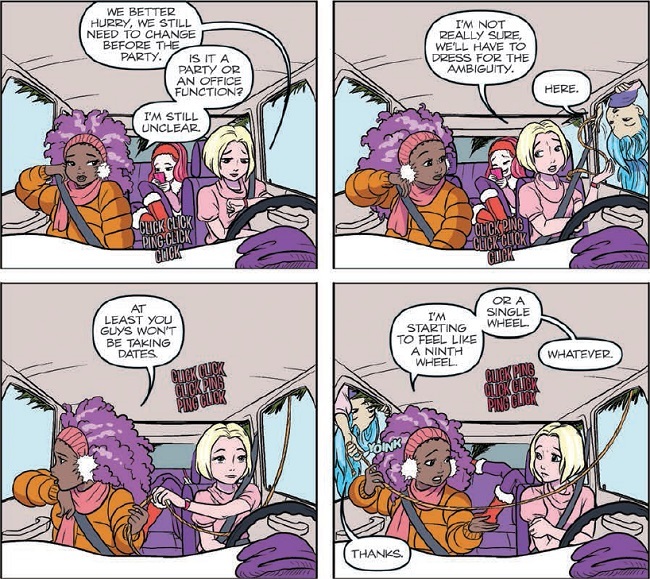 This comic has, in small part, made efforts to flesh out her character and I, for one, find her utterly charming and adorable; but in this issue, we get to see a side to her that’s a little different. After a bad date with a hipster lumberjack, an overtired Shana is seen flirting hopelessly with Tony, the cute bartender person. Looking absolutely gorgeous, our slightly insecure and unsure of herself Hologram is at her most fantastically adorable while a little bit tipsy and gesturing gleefully. I love everything about this scene and the ways in which it connects us with Shana in shared understanding of how it feels to be lonely when all your friends seem to be shacking up, or in our brave moments of flirting with abandon, even in the knowledge that we will cringe at ourselves (ever so slightly proudly) the next morning. The second thing that sticks out is how honest the comic feels when the two rival bands decide, despite their antagonistic relationship, to do something nice for one another. The Secret Santa gift-giving could easily have felt forced, but Jerrica, in true superhero style, decides that the Holograms will be the bigger band and endeavour to give thoughtful gifts to their rivals. Meanwhile, the Misfits refuse to be outdone, whether making music or buying presents. So, with a little help from Kimber and Stormer, each band member ends up being surprised by and thankful for their individual gift. 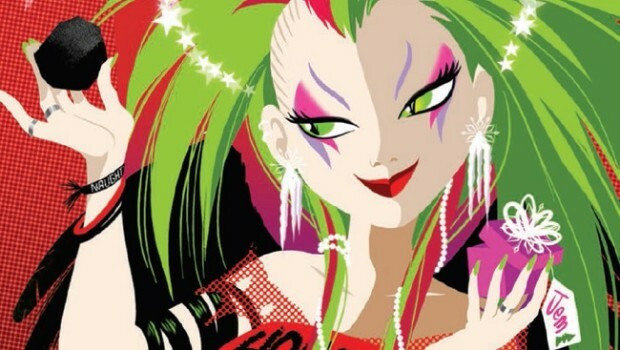 Most astonishing of all, however, is the gift that Pizzazz gets for Jem in that it reflects the true nature of their rivalry. Pizzazz gets Jem the end-all of all roadie emergency kits, designed to stand up to any disaster that could befall a musician. And it speaks to the heart of both the comic and the characters in their ambitions to become successful and talented artists and performers, spurned on to further greatness through the trials and tribulations of going up against worthy competition. 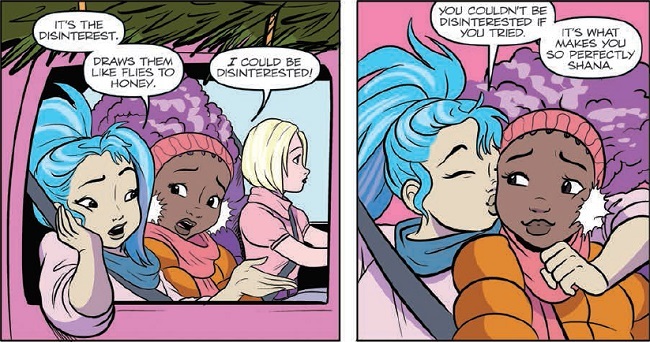 And that is what makes the Jem and the Holograms Holiday Special so successful and enjoyable. It doesn’t go in for the standard story or the clichéd moment; its storytelling, from sister squabbling to romantic longing, captures the enthusiasm of its creative team and runs with it. 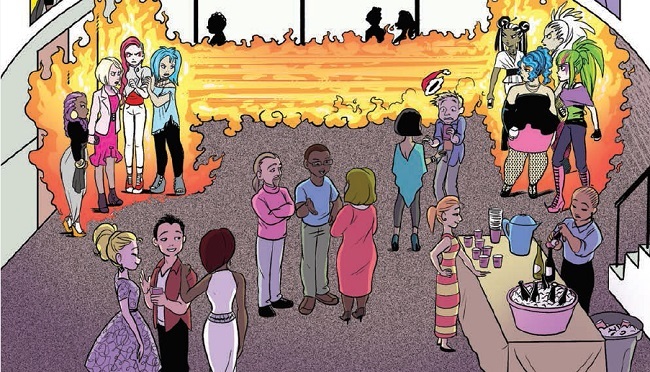 Each moment in this comic is tender, quirky, comical and true. Thompson, Mebberson, Robado and Lee have done an excellent job of creating the fun filled Christmas themed comic I didn’t even know I wanted, and if the holidays mean anything at all to you, you’ll want to read this one too. Until Dark Jem, Happy Holidays! Writer. Reader of comics. Martial artist. From Republic City.